Hey all. I'm new here so don't crucify me I think I have a problem with my BT phone line, either to my street, or to my house. There are no obvious effects on the phone service, but it's the Internet that is the problem. I'm getting very low speeds, less than 1Mbps. 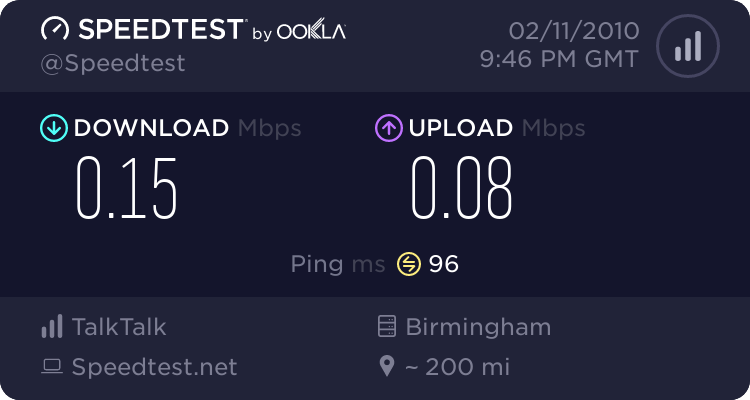 (About 0.5Mbps during the day and 0.05Mbps at night times) I'm with Carphone Warehouse Broadband and the advertised speed is 8Mbps. I got an expert's opinion on it and he told me that it was most likely the phone line that was the cause of the terrible speeds. What can I do about this? I suspect the advertised speed is UP TO 8Mbps. The speed you actually get depends on the length and quality of your line. Hi. zrainey, welcome to the forum - don't worry no-one will crucify you here. If your broadband is provided by carphone/talk talk, then you need to contact them to rectify your broadband. If there is a fault then they will get Openreach engineer to sort. Okay I'll contact them now and report back what I find, thanks. Damaged phone line Broken again.